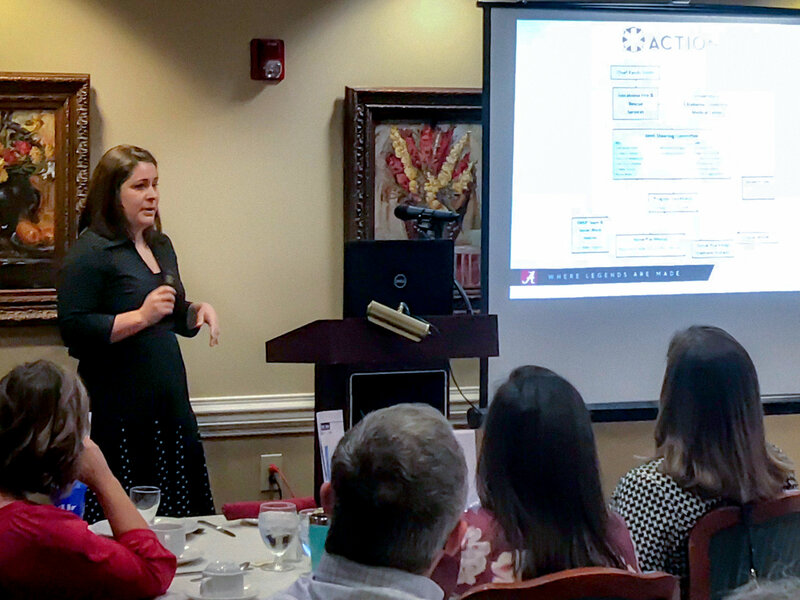 Several College faculty members presented their research during an Interprofessional Research Breakfast for University of Alabama faculty and staff hosted October 18 by the College’s Institute for Rural Health Research. Among the work highlighted was the ACTION Program and the All of Us Research Project. ACTION: Short for Appropriate Care and Treatment in Our Neighborhoods, the program seeks to reduce unnecessary use of ambulances and hospital emergency departments for routine medical needs by providing onsite care for non-emergency 911 calls. Dr. Abbey Gregg, assistant professor in the College’s Department of Community Medicine and Population Health, is researching savings to the health care system and patients who use ACTION, and if patients are satisfied with care received through the program. “We’re interested in how much money can be saved, and how people feel about their care,” she said. ACTION is a partnership of the College and Tuscaloosa Fire and Rescue Services. The program places a nurse practitioner and mental health professionals on low-emergency 911 calls. Onsite care is provided to patients who don’t require ambulance transport to an emergency room, and patients with unmet social needs that impact health also receive follow-up service. Gregg said ACTION has assisted with 911 calls received by people suffering from depression, anxiety, high blood pressure and general aches and pains. Now in its second year, she said data shows the program saves $2,603.77 per patient in avoided treatment charges. Going forward, Gregg said ACTION will seek to be proactive by reducing hospital readmissions, providing case management services for frequent 911 callers and establishing a “social work hub” in the community. All of Us: Precision medicine is an emerging approach for disease treatment and prevention that considers individual differences in lifestyle, socioeconomic status and biology – with the potential to show how each of us can receive the best possible care based on our unique makeup. “It’s like prescription eyeglasses, insulin pumps and hearing aids, which are developed based on an individual’s specific needs,” said Dr. John C. Higginbotham, the College’s associate dean for Research. Higginbotham also serves as chair of the College’s Department of Community and Rural Medicine and director of IRHR and is also serving as UA’s interim vice president for Research. Health care is often targeted to the average patient, not the individual, so, the National Institutes of Health launched the All of Us Project to advance research into precision medicine. The project seeks to enroll one million individuals living in the US and gather their health information and other data over time. The College, through its University Medical Center, is part of the Southern All of Us Network and is working with partners in Alabama, Mississippi and Louisiana to recruit participants; Higginbotham is a co-principle investigator. Together, the Southern All of Us is working to recruit 100,000 participants from the three states over the next five years. The College’s goal is to recruit 7,500 patients during that time. All of Us is making a concerted effort to produce a research cohort that is diverse – demographically, geographically, medically and those traditionally underrepresented in biomedical research. Higginbotham said traditionally, there hasn’t been enough research to draw on for clinical evidence, especially in diverse populations.